Somewhere, deep in our lizard brains, we all intuitively understand that kitchen sponges are absolutely disgusting. And yet! We as a society tend to turn the other way and use them for weeks, or even months at a time. Sure, you can throw your sponges in the microwave or the dishwasher, and feel like you “sanitized” them, but we all know that that’s only delaying the musty, bacteria-addled inevitable. Sponges have their place, but for day-to-day dish washing, might we recommend a silicone scrubber? Unlike porous sponges, silicone is naturally water-tight, and won’t trap moisture or allow mildew to flourish. After you’ve used a silicone scrubber a few times, you can just toss it in the dishwasher for a quick rinse, and it’ll actually get clean and dry. They also double as handy pot holders, since they’re flexible and extremely heat resistant. That’s not to say they don’t have downsides. I’ve yet to find a silicone scrubber with as much scrubbing power as a Dobie pad, you’ll need to keep the sink running since they don’t hold water, and the fact that soap sits on the surface of the bristles makes most scrubbers pretty slippery. But the simple fact is, silicone scrubbers do what you need them to do 95% of the time: They scrape food off of plates, and move water and soap around them until they’re clean. And they do all of this without smelling weird or serving as a bacteria brothel. We rounded up a few cheap options to get you started. These basic scrubbers from UUSHER are well suited for cleaning up a couple of plates and glasses after dinner, and are incredible affordable. I got one of these scrubbers bundled with a set of silicone sous-vide bags, and it introduced me to this whole concept. 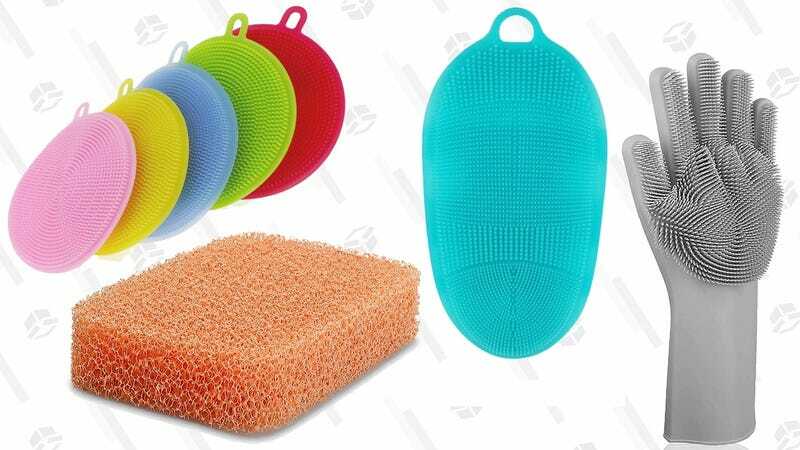 Solid everyday scrubbers, these include a lot of thin bristles for scraping, but they’re too flexible to be effective against really stubborn, stuck-on food. These pads are also very slippery in use, but they’re small, unobtrusive, and all you need for cleaning a few quick dishes after dinner. 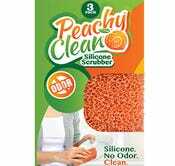 Peachy Clean scrubbers use an intricate latticework of silicone fibers, shaped to look and perform like a regular kitchen sponge. They tend to break down after a few months, but they do a great job of holding onto soap and water while you’re working on dishes. Unless you felt it with your bare hands, you’d think that Peachy Clean was a regular kitchen sponge. 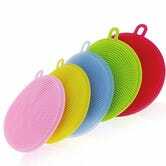 Its thin latticework of silicone holds onto soap and water more readily than other scrubbers, though at the expense of durability. Since the silicone fibers are so thin, expect to only get 2-3 months of use out of each one before it starts breaking down. Luckily, at $10 for a 3-pack, that’s not a huge deal. 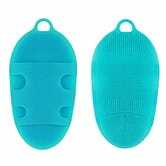 While INNERNEED’s silicone scrubbers are designed to be used as shower gloves, they’ll work great on dishes as well. Many scrubbers get around the slippery soap conundrum by literally strapping to your hand. This one is marketed as a bathing and exfoliation tool, but it’s actually perfectly designed for dish duty. The hand strap helps you get more torque since you don’t have to worry about holding onto the scrubber, and the varying sizes of bristles can stand up to tougher food messes than scrubbers with only thin, wispy bristles. 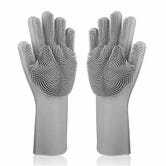 Silicone scrubber gloves will keep your hands dry while you work on dishes, and offer unparalleled maneuverability. For the best possible scrubbing experience, just wrap up your hand in a ridiculous looking silicone scrubber glove. Everything from your fingertips to your wrist will be covered in cleaning bristles, but since silicone is waterproof, your hands should actually stay dry if you need to quickly stop to answer your phone. Want to feel physically uncomfortable for a second? Just think about wearing a kitchen sponge glove. You’re welcome.